GCE provides various kinds of metrics from which one can create dashboard, alerting policies etc. However, there is no way to monitor performance of rippled unless we wrote something ourselves. Fortunately, GCE allows creating custom metrics. So as a starting point, I decided to create a metric for rippled build_version. This information is very useful. For example, you will be able to tell if the behavior of the server changes after version changes. However, I later learned that custom metric can't have "STRING" as its value type. 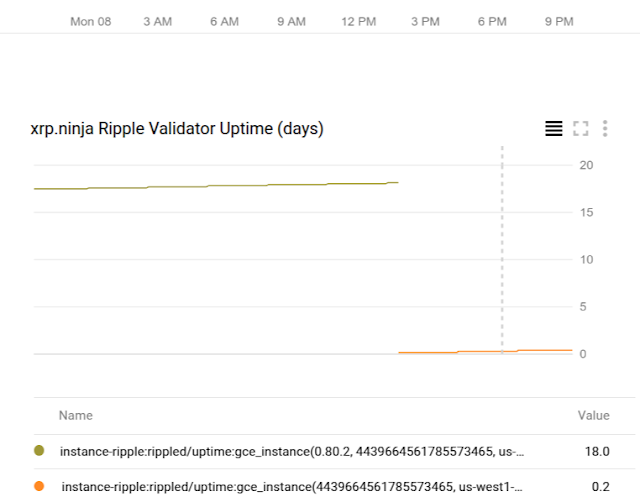 So I created an uptime metric with build version as its label. It works just the same. Unfortunately, it seems I can't share this chart publicly, unlike charts created from built-in metrics which can be shared publicly.